A pair of porcelain polychrome dogs. Exported Porcelain. XVIII / XIX. 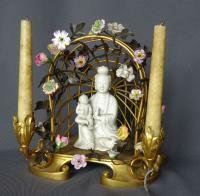 Restaurations. An Italian ceramic amphora. Deruta. Ca 1900. 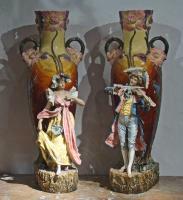 A pair of Austrian polychrome terracotta by Johann Maresch. Ca 1900. A Continental ceramic amphora after the greeks ones. Ca 1920. An Austrian polychrome terracotta by Johann Maresch. Ca 1900.